1.) U.S. Not Attending World Racism Talks? You may be surprised to learn that nearly 200,000 South Asians reside in the state of New Jersey. SAALT’s New Jersey Community Empowerment Project developed from a series of meetings in 2004 with South Asian organizations in New Jersey, allies, and concerned South Asian individuals. Through these dialogues, it became clear that South Asian communities in New Jersey are underserved and largely voiceless in policy debates. To learn more about the New Jersey Community Empowerment Project, or to read our report highlighting key issues affecting the South Asian community in New Jersey, “A Community of Contrasts: South Asians in New Jersey,” please check out SAALT’s local initiatives page. “We come together, as organizations serving South Asian communities here in New Jersey, to denounce the recent hate crimes and bias incidents that have taken place in our state. The South Asian community in New Jersey, with a growing population of 200,000, has long confronted bias and discrimination, beginning in the 1980’s with the attacks perpetrated by the ‘Dotbusters’ and the post-9/11 backlash. 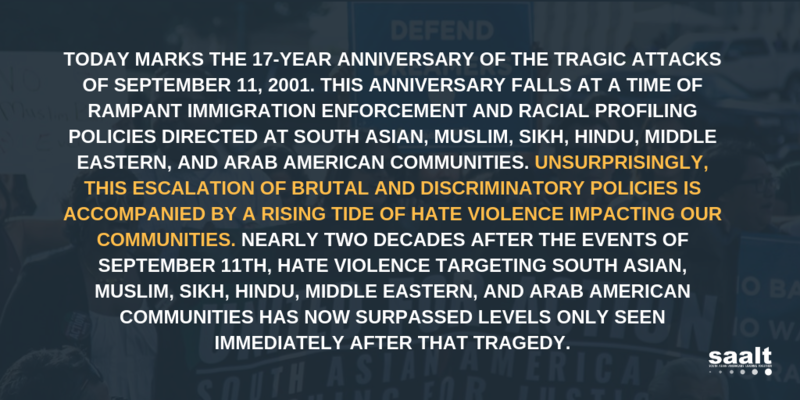 In addition, our organizations – Manavi; the Sikh Coalition; the Council on American Islamic Relations (CAIR-NJ); South Asian Mental Health Awareness in Jersey (SAMHAJ); and UNITED SIKHS – have observed a rise in New Jersey, which we believe has fostered an environment where bias incidents and hate crimes can occur. Today, we stand in solidarity not only with the Grewal family – victims of a cross-burning outside their home; Mr. Ajit Singh Chima – an elderly Sikh man who, on October 30th, in Wayne, New Jersey, was violently punched and kicked in the face several times by an unidentified man, and as a result suffered several fractures around his eyes and jaw; Gangadeep Singh – a fifth grade student who, on October 8th, was attacked in Carteret, New Jersey while walking home from school by an unidentified masked assailant that threw him on the ground and cut off his hair – but with all survivors of bias and hate crimes. Please join us for a march and rally in support of the Grewal family on Saturday, November 15th at 3PM in Hardwick, New Jersey. The ‘Unity for the Community’ March will start at the Municipal Building and end at the Grewal residence with a rally. (qudsia@saalt.org) or call (201) 850-3333.